Around two million blog posts are published every single day. Sounds like a huge number, right? But when you’re scrolling through Twitter and other social media sites and see the sheer amount of content people are throwing around, it doesn’t seem so crazy. Do you know what is crazy? That for all that content out there, 55% of readers will read a blog post for fifteen seconds or less. Makes sense when we’re living in a fast-paced world where everyone has somewhere to be and things to do. But that’s not good news for you or your business. You want readers to dig deep into your whole post, and you can get them to do that - it just needs a little more effort than hitting publish and hoping for the best. So what can you do if you want readers to read the entire post? First of all, think about the aim of your content. In order for your content to perform well, it’s important that you know why you’re implementing it. These are just two aims you might have for your content, but they’re probably the most popular. For the purpose of this blog post, I’m going to cover how you can keep your readers engaged for longer than fifteen seconds so your content can achieve one of the two goals above. Ready to convert more customers with your content? 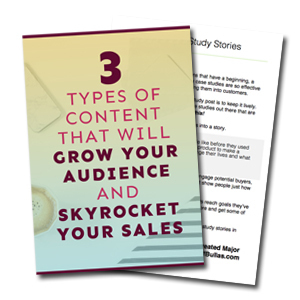 Grab your FREE guide to the three best kinds of content that will help you do just that! To boost your authority, you need to be seen as an expert in your niche. Maybe it seems daunting when it feels like there are hundreds of other blogs out there doing much better than you, but remember humans like to make connections with humans - they want your spin on the topic. That’s what makes you an authority. First things first, your content needs to be accessible. Long words and jargon-filled sentences are a no-go, which can be confusing when you want to get to the top of your industry: surely using all the lingo will mean people know you know your stuff, right? Consumer attention spans are rapidly decreasing by the year, and to keep their attention, you want to create a conversation; a two-way dialogue if you will. And writing in a compelling, conversational way does just that. Think about the content Neil Patel and Jeff Bullas write. It’s authoritative but it’s accessible and easy-to-read. Sentences are short and there’s not a jot of jargon in sight. Remember that earlier stat? That there are around two million blog posts published a day? Yeah, there’s a lot of the same drivel knocking around out there. For many industries, the content is drab and dull, with most business blogs churning out the same boring content day in, day out. There’s nothing new; nothing exciting, and that’s what turns people off. You can avoid this by implementing your own twist on topics; maybe it’s by peppering the text with personal experiences or adding in your own sense of humour. Anything that makes your content a) more human, and b) less dull is a winner, plus your past experiences will add to your authority. As well as adding your own twist to things, you can dig even deeper into popular topics out there. The main mistake company blogs make is just scratching the surface of a topic idea and leaving readers high and dry. To counteract this (and keep people on your site longer), add in data, stats, and images to keep things compelling and to make sure you’re not just pulling back the first layer, but are instead digging as deep as you can into a topic. It helps if you publish focused topics. Rather than creating a blog post on a general idea (like How to Save Time) which is a huge undertaking and might never get to the bottom of the “lake”, you can create laser-focused topics that dig deep into a smaller part of the umbrella idea (something like How to Free Up Three Hours a Day by Batching Tasks). This is the big guy; the one most companies are gunning for. Blogs are perfect for generating conversions, building your customer base, and getting more sales - but only if you know what you’re doing. Most of the time, businesses will whack in their conversion spiel at the bottom of a blog post. But we already know that the vast majority of readers won’t get that far, right? So how do you counteract that? Don’t limit your conversion spiel to the bottom of the post. Instead, litter it throughout with an opt-in form or a button that lets readers find out more a quarter of the way down the page. The quicker they know how you can help them, the more likely they are to convert. Think about it this way: maybe someone lands on your site who really needs your services, but they scroll for 15 seconds through a blog post and don’t come across a call-to-action that lets them know you can help them. So they leave and go to your competitors site who, lo and behold, has a call-to-action within the first three paragraphs of their blog post. Guess where they’re going to take their business? I mean, sure, these aren’t real posts, but they could be. You get the gist. These brands are so focused on themselves, they forget to talk to their audience and therefore lose out on conversions. If you’ve got fifteen seconds to hook a reader, you need to make it about them. Think about the major pain points they have and create content that helps solve that or ease the pain. Fifteen seconds may not sound like a long time, but it’s long enough. Your main focus should be hooking the reader and making sure they want to read on. If your goal is to boost your authority, you can do that by adding your own insights, peppering in data and fascinating stats, and writing in a conversational tone - all of which makes your post stand out against the thousands of others harking on about the same old thing. And, if you want to generate more conversions and make more sales, you need to optimise your blog for that, either by adding a call-to-action in the first half of the post, or focusing your content on solving a problem rather than making it self-serving. Ready to get readers to stick around for longer than fifteen seconds? Schedule a chat to see how we can make that happen.